The crumhorn is a double reed instrument with a narrow cylindrical bore. The double reed rests on a staple within the windcap through which the player blows with no direct contact with the reed. The instrument curves up at the end, which is slightly flared; the curve is made by steam bending the instrument. Sand would have been packed into the bore to prevent kinking. This curve is possibly related to the pibcorns and horn pipes that preceded it. The instrument's range is very limited; to nine notes in fact as the crumhorn posseses no speaker key. Mike plays the bass crumhorn on Woof! Woof! 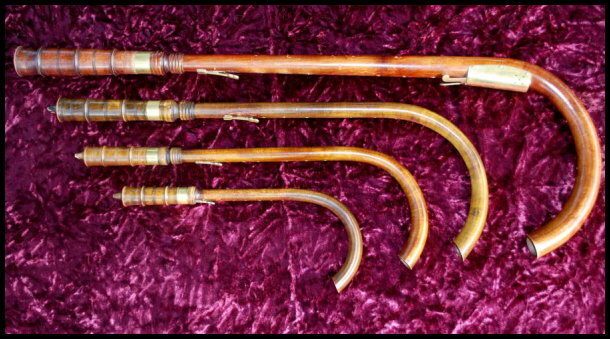 Crumhorns appeared in Europe towards the end of the fifteenth century and were used mainly for consort music. Mike's set are soprano, alto, tenor and bass instruments made in the 1970s by Wood of Bradford in the workshops of what is now a company called The Early Music Shop (EMS) www.earlymusicshop.com and based in Salt's Mill, Saltaire, near Bradford. This set were modelled on a set of crumhorns in the Brussels Conservatoire Museum and belonged to a nobleman in Italy during the second half of the sixteenth century. Woods went to Brussels where they played, measures, photographed and x-rayed the instruments to make as faithful a reproduction of the originals as posible.